Would like to say a massive thank you on behalf of myself, family and six special friends who had the BEST week every with Sunshine World, special thanks to Sean, Sarah, Matty and Graham. All of us bar one were beginners and after fantastic tutoring and patience finished the week buzzing on a RED run, something we never dreamed we would be able to do. 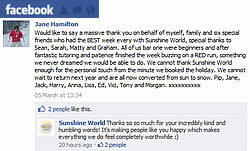 We cannot thank Sunshine World enough for the personal touch from the minute we booked the holiday.